The 23-acre, $650-million multi-use development project by Kilroy Realty has gotten its share of attention, mostly thanks to residents’ pushback. Here’s what all the fuss is about. Kilroy Realty pitches its One Paseo project, a 23-acre, $650 million development, as a little island of progressive development – a main-street core of Carmel Valley – within the larger suburban expanse. Yet no project since the planned overhaul of Balboa Park or the development at an old golf course in Escondido has generated so much hostility. Why? What would the development look like when it’s finished? What are the basic arguments about? Here’s what we know: Broadly, the community around One Paseo is worried about what the dense development means for the future of their neighborhood. Many of their objections boil down to worsening traffic. Movement on the project was delayed a bit when Council President Sherri Lightner decided to push back the full Council’s vote. That’s coming up Feb. 23 at City Hall. In the meantime, here’s what all the fuss is about. First of all, the above map reflects (generally) the updated plan Kilroy drew up in 2012, which has since had a few tweaks in things like office building height. Responding to requests that they explore scaled-down options, Kilroy took out plans for a big hotel and decreased office and retail space by a little more than 10 percent. 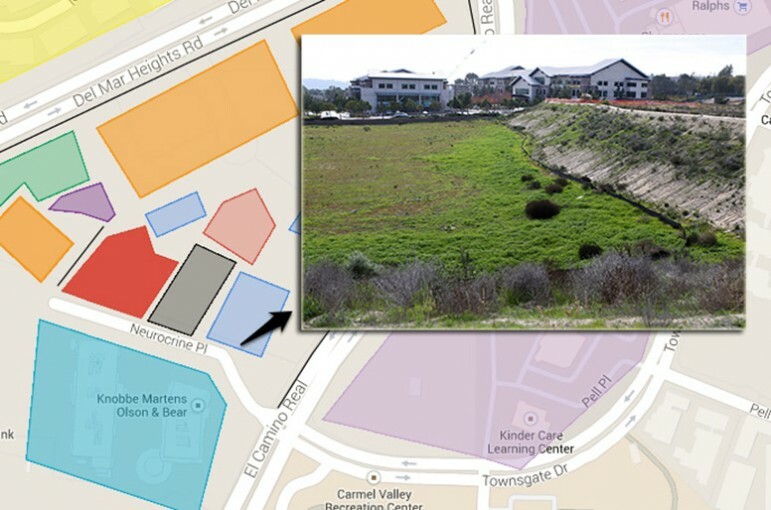 Still, the project includes more than the 500,000 square office space that the 23-acre parcel is zoned to accommodate, per Carmel Valley’s 1975 community plan. Kilroy, after purchasing the lot, is asking to change the community plan. City Council still has to approve amending it to get One Paseo backers to their next step. Here’s Kilroy’s latest rendering of the site. The biggest sticking points, and the issues that are the most difficult to picture without a completed One Paseo, are traffic and public transportation access, building height and whether the project will fit in with the neighborhood around it. One Paseo’s primary opposition group, called What Price Main Street?, has made the case that the greatest toll on residents’ lives will be gridlocked traffic in the area. 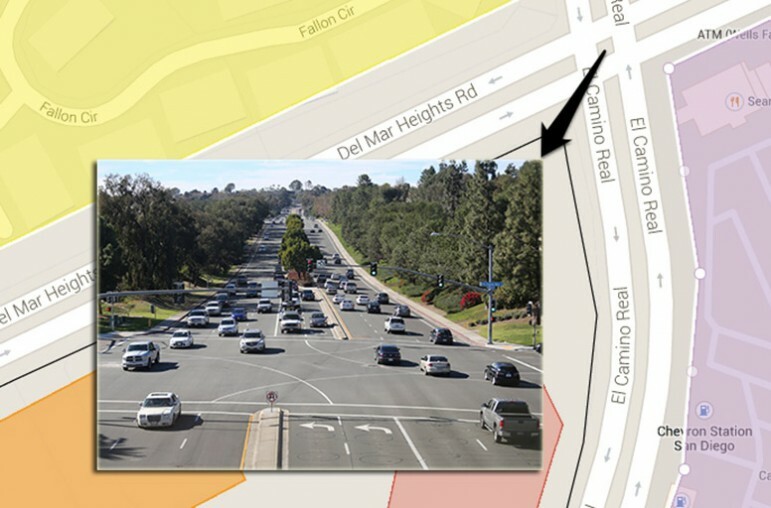 Things kicked up a notch at a 2013 meeting of the Torrey Pines Community Planning Board, where then-chair Dennis Ridz and former City Attorney Mike Aguirre rhapsodized on what increased traffic would mean for emergency vehicles trying to get through. 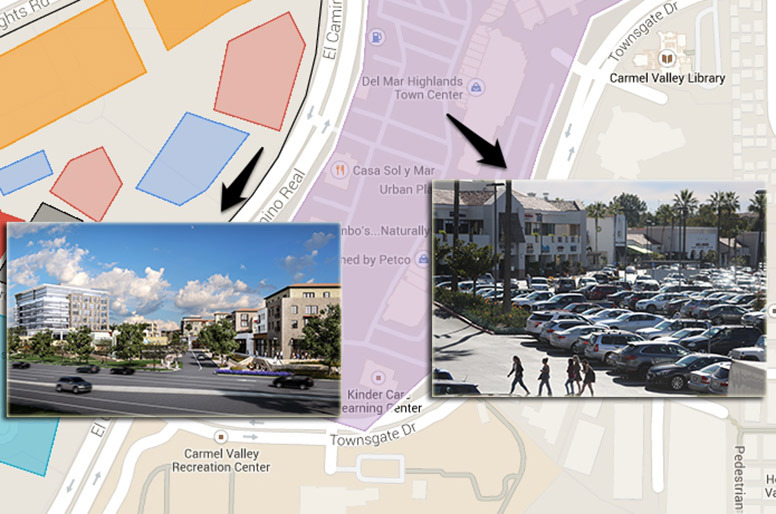 Nearby Del Mar Highlands Town Center – the split-level shopping center on the other side of El Camino Real along Del Mar Heights Road, blocked off in purple on the Google map – has also pointed to traffic as its primary problem with the development. 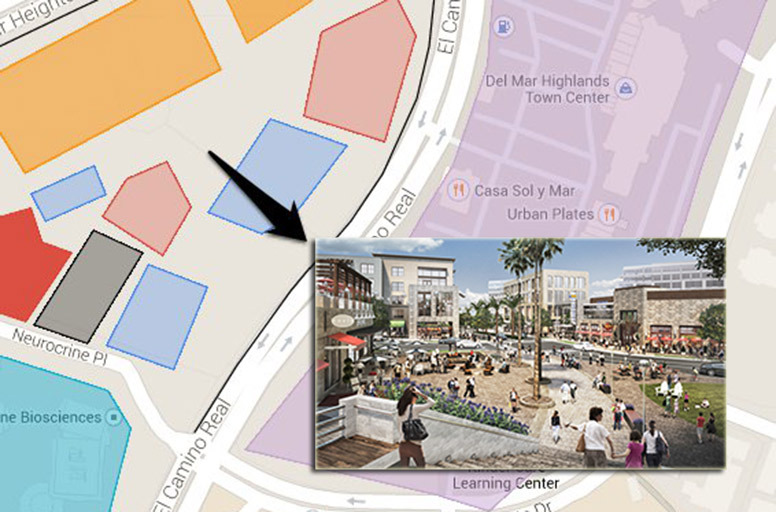 Back in 2013, San Diego Reader reported Del Mar Highlands Town Center’s developer and owner Donahue Schriber planned to spend $10,000 to persuade city officials to “ensure project’s consistency [with] existing [community plan] and Del Mar Heights Town Center.” The year before, Kilroy’s vice president had accused Schriber of donating to What Price Main Street?, which the group denied. Well, the developer’s original proposal to build 1.8 million square feet of usable space, per the environmental report, would add 26,961 trips to the area every day. The new proposal, scaled down to 1.4 million square feet, would add 23,854 trips each day. That’s three times the total trips that would be generated by the project that’s already approved to be built on the 23-acre parcel. 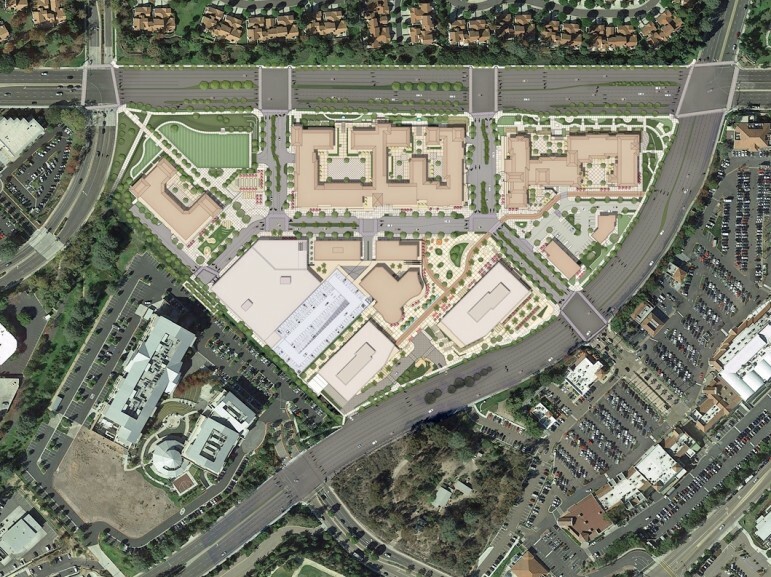 That project – a 500,000 square foot office space – would produce 6,500 daily trips. If the empty lot on the intersection’s southwest corner were to be built into 500,000 square feet of office space – the project that’s already approved, which would generate 6,500 trips per day – there’d be fewer than 200 additional cars going through the intersection during each rush hour, or a little less than a 5 percent increase in the total traffic flow. In the afternoon rush hour, the 1.8 million square foot proposal would generate 33 percent of the current volume, or 1,398 new trips. “Any of the other alternatives will be somewhere in between,” Mahzari said. Kilroy addressed some of those concerns in its update this month. But the units are totally different, making it a little tough to say whether the developer has made significant improvements to its plans to mitigate traffic. Kilroy wants to upgrade traffic signals and synchronize them along Del Mar Heights Road, El Camino Real, Carmel Country Road, Carmel Creek Road and Valley Centre Drive. According to Kilroy’s numbers, that’d improve current travel time during morning rush hour by 8 percent and afternoon travel time by 13 percent. So along Del Mar Heights Road, it’d take you 6.4 minutes to drive between Mango Drive and Carmel Canyon Road during morning rush hour, instead of the 6.9 minutes it’s taking you now. That doesn’t tell us what the traffic would be if the 500,000 office project goes ahead instead of One Paseo. Kilroy’s update also addresses emergency response. Pre-emption GPS technology would target traffic signals in 40 or so intersections to get emergency vehicles through more quickly. So in theory, Aguirre could rest easy. Jack Shu of the Cleveland National Forest Foundation — the organization that successfully sued the San Diego Association of Governments (SANDAG) because its long-term transportation plan didn’t invest enough in public transportation and fell short of state carbon emission requirements — also opposes the project. “What I think of it is, it’s a trendy development that may have the look or feel and maybe the terminology of what future development should be like, but in reality and in most ways it is still a development for a car-centric system that is unproductive to our long-term goals,” he said. Some of those 600 condo dwellers will avoid some car trips they’d make in a traditional suburb; the developer says it’ll run shuttles to the Coaster station; it’s a good option for Car-2-Go and ride-sharing options to replace some traditional car trips; and some nearby residents will be able to bike or walk over, especially kids and teenagers. 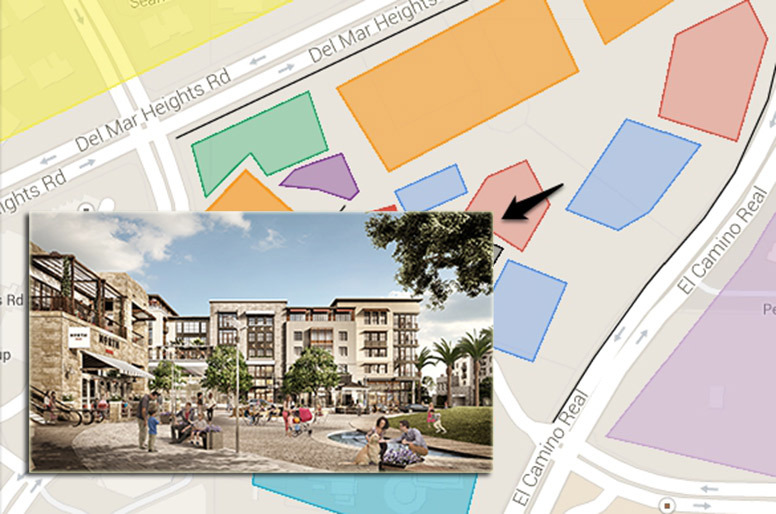 Dense development has been a selling point for One Paseo, in line, the developers say, with making San Diego “a city of villages.” But residents have been anxious about the impact of adding tall buildings to the community. That’s down near the plot’s southeastern tip, next to the Neurocrine Biosciences buildings. Kilroy also owns the Neurocrine buildings, called The Heights, which stand at about 76 feet. “But it’s a bit misleading as a comparison to the office buildings at One Paseo,” One Paseo spokeswoman Rachel Laing said in an email, “because The Heights is on a hill, whereas the One Paseo office buildings next to it will start at ground level, so the eye will not register such a big difference.” Laing said the Neurocrine buildings appear about 100 feet from street level on El Camino Real. 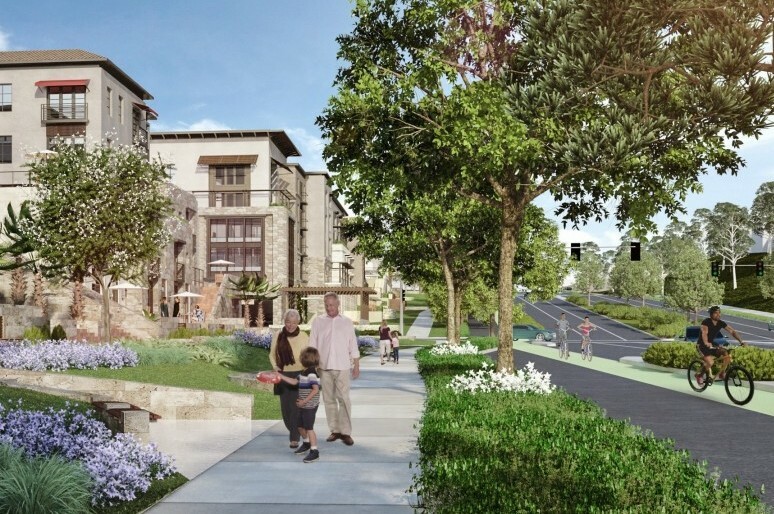 While One Paseo’s been pitched as a progressive, dense “island” in Carmel Valley, this has been precisely what opponents hate about it. How can something like this mesh with the community? Would it mar what residents love about their neighborhood? Kilroy says it has tried keep the layout of the development in line with surrounding neighborhood features: offices to the south, residential to the north and retail to the east. 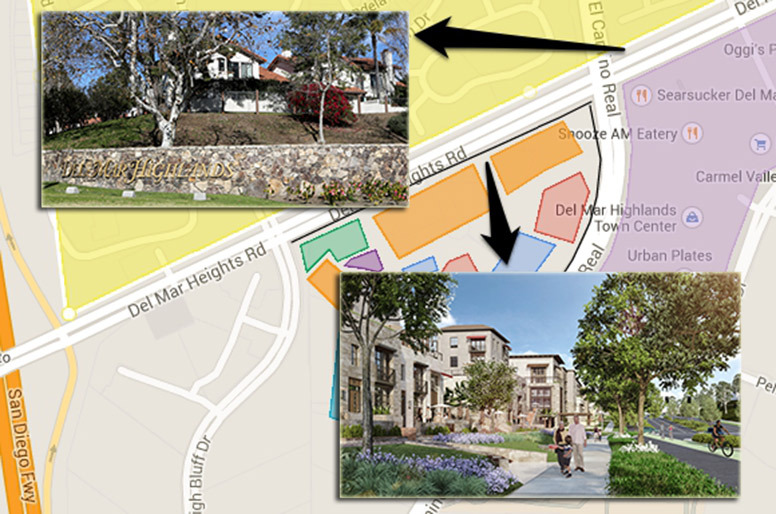 That orange block just below the Town Green at the corner of High Bluff Drive and Del Mar Heights Road is also residential. It’s supposed to be four to six stories high right around the highest point of the property. Whether Kilroy’s adjustments to the project are enough to pass muster and change the community plan as a whole comes down to City Council late next month.